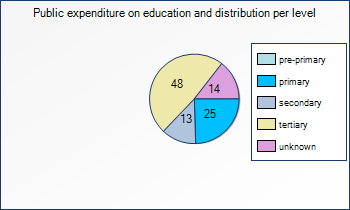 Percentages of children in school are represented by Gross Enrolment Ratios (GER) and Net Enrolment Ratios (NER). GER is the number of pupils enrolled in a given level of education regardless of age expressed as a percentage of the population in the theoretical age group for that level of education. NER is the number of pupils in the theoretical age group who are enrolled expressed as a percentage of the same population. All the education statistics, with the exception of the literacy data, refer to the year 2005 unless otherwise noted. For more information on rates of out-of-school children, or other indicators see the online education glossary.